The Australian pied cormorant (Phalacrocorax varius), also known as the pied cormorant, pied shag, or great pied cormorant, is a medium-sized member of the cormorant family. It is found around the coasts of Australasia. 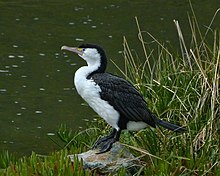 In New Zealand, it is usually known either as the pied shag or by its Māori name of Kāruhiruhi. Older sources may refer to it as the "yellow-faced cormorant". The pied cormorant is predominantly black on its back and upper surface of the wings and white on the underside with males weighing approximately 2.2 kg and females 1.7 kg. It stands between 65–85 cm tall, with a wingspan of 110–130 cm. A small yellow patch between the bill and the eye on each side of the head is likely to have been the reason for the historical common name. It has large webbed feet which it utilises to pursue fish underwater, steering with half opened wings. The bird has a large hooked bill, green eyes with a blue eye ring and black legs and feet. The eyes have a special nictitating membrane for underwater protection. The pied cormorant can often be seen spreading its wings after diving to help dry the feathers, as it has inadequate waterproofing. This lack of feather waterproofing may help the cormorant spend longer underwater due to decreased buoyancy effects. There are two recognized subspecies; Phalacrocorax varius varius (New Zealand) and Phalacrocorax varius hypoleucus (Australia) with slight variation in physical characteristics. Similar species include the Black-faced cormorant (slightly smaller) and the little pied cormorant (substantially smaller). The pied cormorant is listed of least concern in the IUCN red list of threatened species, reflecting its large range with a relatively stable population. In New Zealand its range on the east coast extends as far south as Christchurch, though this is a recent extension—older books report it no further south than Kaikoura. The range extensions have accompanied population recovery from heavy persecution in the early 1900s and likely represents recolonization of the former range. The pied cormorant is listed as Nationally Vulnerable in New Zealand. The population has been growing from around 700 breeding pairs in the 1950s to an estimated 3,000 pairs post 2000 (Refer to population trend data). In Australia it is only moderately common in the eastern states (both the coast and inland wetlands), but abundant in the south-west, particularly along the coast. Its federal conservation status is ‘secure’ and only changes to ‘near threatened’ in Victoria. It can be found in all states except Tasmania. The pied cormorant has been calculated to be at high-moderate risk from fishing – particularly from set and inshore drift nets. Birds in colonies can often be observed entangled in recreational fishing line with hooks embedded in the body. In the past, the pied cormorant was seen as competition for commercial fishing and sometimes shot. Although typically found in marine habitat—sometimes solitary, sometimes in pairs, sometimes in vast flocks of hundreds or thousands—it is also attracted to inland waters, including lakes, deep and open swamps, and rivers. In Australia, the birds can often be found at inland waterways while in New Zealand it prefers coastal areas close to its prey. Adult birds are sedentary and can often be seen roosting in trees, on rocks or logs in the water. The birds seem unaffected by variable salinity, turbidity and shoreline vegetation provided there are available perches. The pied cormorant appears to feed largely (90%) on benthic fish 6–15 cm in length from waters less than 10m deep. Other dietary components (10%) are made up of crustaceans such as prawns and shrimp with some molluscs and cephalopods. It will dive both in shallow, still water and in rapidly moving currents. Typical dive times are around 40 seconds, with a recovery period of 10–15 seconds between dives although this is dependent on depth. The birds feed in deep and shallow waters (although shallow habitats are more productive) with flock densities in proportion to the prey abundance. Hunting is typically performed as individuals (potentially to avoid kleptoparasitism), although larger groups can be observed when schools of small fish are close to the surface. Risk of predation by sharks and the abundance of food comprise a trade-off where the pied cormorant may choose to hunt in deeper waters where prey is less abundant if the risk is too high during warmer months when sharks are present more often. The deeper waters however require longer dive times and corresponding longer times at rest between dives on the surface. The pied cormorant preferably breeds in small (<30 pairs) sheltered colonies (harbours, estuaries and lakes) with rarer occurrences on exposed coasts or islands, no more than 400 metres from the sea (or food source). Courtship behaviour is initiated by the male in close proximity to a future nest site. Wing waving by the male is conducted in silence while gargling can be a form of female recognition. The males can also hop up to 1m in the air with both feet to attract female attention. Nests are typically large platforms formed of sticks and foliage cemented with droppings averaging 80 cm in diameter on the ground or in trees. Males collect most of the nest material, while both sexes share construction tasks. The nests are used twice a year in Autumn and Spring by different breeding pairs. Some breeding occurs in summer and winter by young and inexperienced pairs. Monogamous breeding pairs (from 2 years of age) lay eggs once a year with an average breeding cycle of 6 months. Clutch size ranges from 2-5 with an incubation period of 25–33 days. Egg and fledgling caring duties are shared by the parents. Chick rearing can take from 47–60 days with independence gained just over 3 months of age. Both sexes share feeding duties through incomplete regurgitation. Banding studies have shown that the pied cormorants do not travel far from their colonies (<20 km). Flight is generally low in altitude, as the pied cormorant has weaker flight capability than other species in the family, with ‘v’ formations present when in flocks. The Noongar Aboriginal people who live in the south-west corner of Western Australia believe that the pied cormorant (medi) is responsible for the transport of souls of the deceased across and beneath the Western sea to their final resting place (Kurannup). Medi can be translated as ‘agent’, or ‘medium’, possibly referring to the bird's role as an intermediary between the living world and the afterlife. Spirits of the deceased rest for an unspecified time on the moojar (WA Christmas tree) before being carried by easterly winds or flowing waters to the sea where the spirit joins with the medi for its journey to Kurranup. ^ BirdLife International (2012). "Phalacrocorax varius". IUCN Red List of Threatened Species. Version 2013.2. International Union for Conservation of Nature. Retrieved 26 November 2013. ^ a b c d Wildlife Management International, (2013). Pied shag: A national population review. Report prepared for the Department of Conservation, Wellington, New Zealand. ^ a b c "Pied Cormorant Phalacrocorax varius". Birdlife Australia. ^ a b c Chambers, S (2009). Birds of New Zealand – Locality guide. 3rd edition. Arun Books, Orewa, New Zealand. ^ a b Powlesland, R G; Sharp, S E; Smith, A N H (2008). "Aspects of the breeding biology of the pied shag (Phalacrocorax varius) at Makara Beach, Wellington, New Zealand". Notornis. 55: 69–76. ^ a b c d Marchant, S; Higgins, P J (1990). Handbook of Australian, New Zealand & Antarctic Birds. Vol. 1, Ratites to ducks. Melbourne: Oxford University Press. ^ Birdlife International (2016). "Phalacrocorax varius. The IUCN Red List of Threatened Species 2016: e.T22696782A93586698". doi:10.2305/IUCN.UK.2016-3.RLTS.T22696782A93586698.en. ^ Oliver, W R P (1930). New Zealand Birds. Auckland, New Zealand: Reed Limited. ^ Robertson, H. A., Dowding, J. E., Elliott, G. P., Hitchmough, R. A., Miskelly, C. M., O’Donnell, C. J. F., Powlesland, R. G., Sagar, P. M., Scofield, R. P. & Taylor, G. A. (2013). Conservation status of New Zealand birds, 2012. New Zealand Threat Classification Series 4. Department of Conservation, Wellington, New Zealand. ^ Rowe, S. (2013). Level 1 risk assessment for incidental seabird mortality associated with fisheries in New Zealand’s Exclusive Economic Zone. DOC Marine Conservation Services Series 10. Department of Conservation, Wellington, New Zealand. ^ a b c d Heather, B D; Robertson, H A (2005). The field guide to the birds of New Zealand. Auckland, New Zealand: Penguin Books. ^ del Hoyo, J; Elliot, A; Sargatal, J (1992). Handbook of the Birds of the World, vol. 1: Ostrich to Ducks. Barcelona, Spain: Lynx Edicons. ^ Lea, S E G; Daley, C; Boddington, P J C; Morison, V (1996). "Diving patterns in shags and cormorants (Phalacrocorax): tests of an optimal breathing model". IBIS. 138 (3): 391–398. doi:10.1111/j.1474-919X.1996.tb08056.x. ^ a b Heithaus, M R (2005). "Habitat use and group size of pied cormorants (Phalacrocorax varius) in a seagrass ecosystem: possible effects of food abundance and predation risk". Marine Biology. 147: 27–35. doi:10.1007/s00227-004-1534-0. ^ a b Dorfman, E J; Kingsford, M J (2001). "Environmental determinants of distribution and foraging behaviour of cormorants (Phalacrocorax spp.) in temperate estuarine habitats". Marine Biology. 138: 1–10. doi:10.1007/s002270000437. ^ Stonehouse, H (1967). "Feeding behaviour and diving rhythms of some New Zealand shags". IBIS. 109 (4): 600–605. doi:10.1111/j.1474-919X.1967.tb00028.x. ^ a b c d Millener, P. R. (1972). The biology of the New Zealand pied cormorant Phalacrocorax varius varius Gmelin (1789). Unpublished. MSc Thesis, University of Auckland, Auckland, New Zealand. ^ Macintyre, K; Dobson, B (2017). "The conveyor of souls: the Pied Cormorant". Anthropology from the shed. Wikimedia Commons has media related to Phalacrocorax varius.